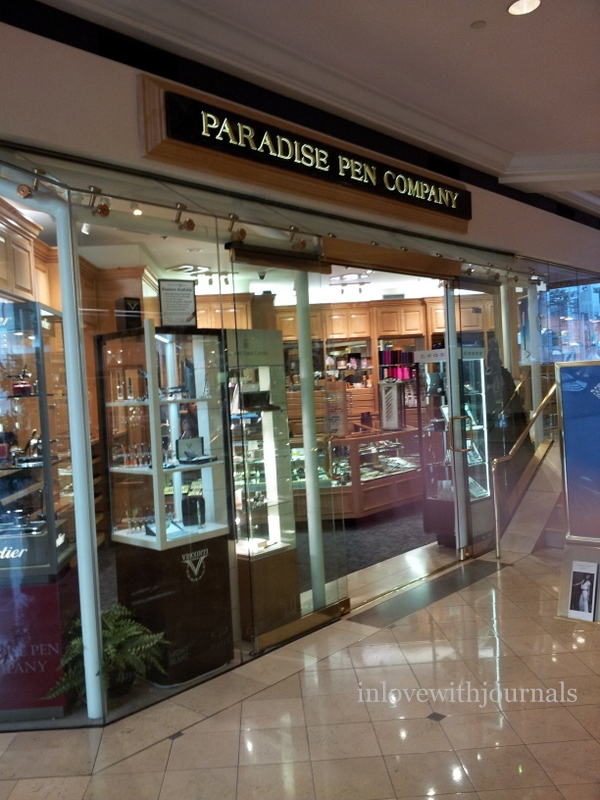 When I was in Phoenix earlier this year, I placed an order with Goulet Pens which I talked about here. Inside the box were two Lamy Al-Star gift sets, in purple, for my sister and I, as presents from our father for Christmas. Tonight I inked it up and took some photos. The super nice box it came in. 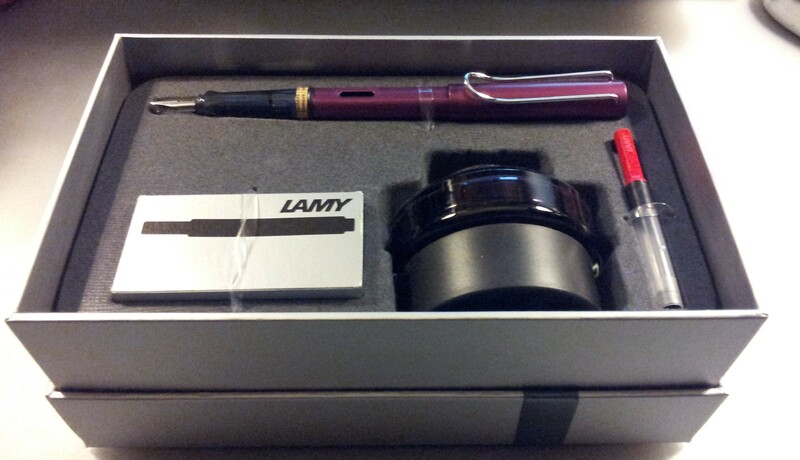 The set comes with a Lamy Al-Star in purple, with a medium nib, a Z24 converter, a package of black Lamy cartridges and a bottle of black Lamy ink. The pen itself comes with a blue cartridge. Lamy Al-Stars differ from the Lamy Safaris in that the body is made of aluminum and the section is somewhat transparent. 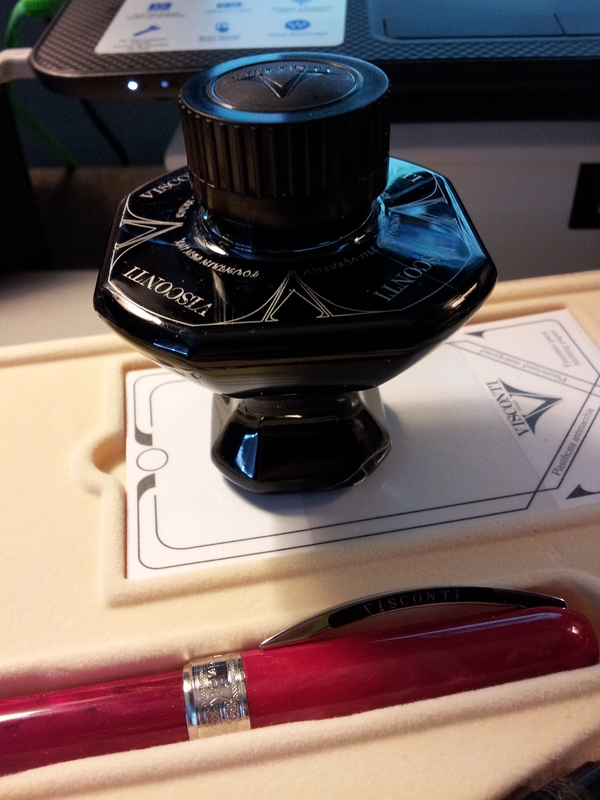 As with other Lamy models you either enjoy the triangular section or you don’t. My sister and I actually had quite an interesting conversation about sections; she is very picky about them (as am I) and didn’t actually realize it until we tried a bunch of different ones. I would recommend trying out a Safari or an Al-Star at your local pen shop before purchasing, just to make sure you enjoy the feel of the pen. 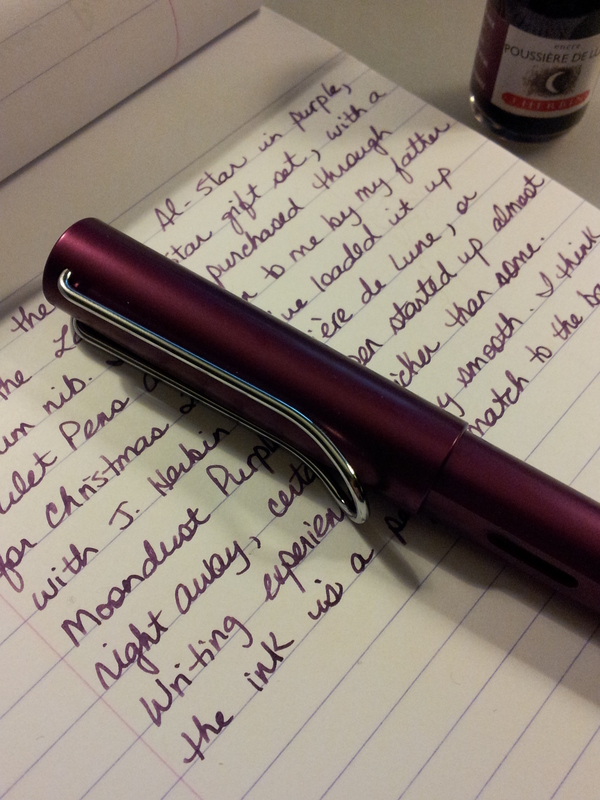 I tend to like the ink to match the barrel colour so I chose J. Herbin’s Poussiere de Lune (Moondust Purple) for this Al-Star. 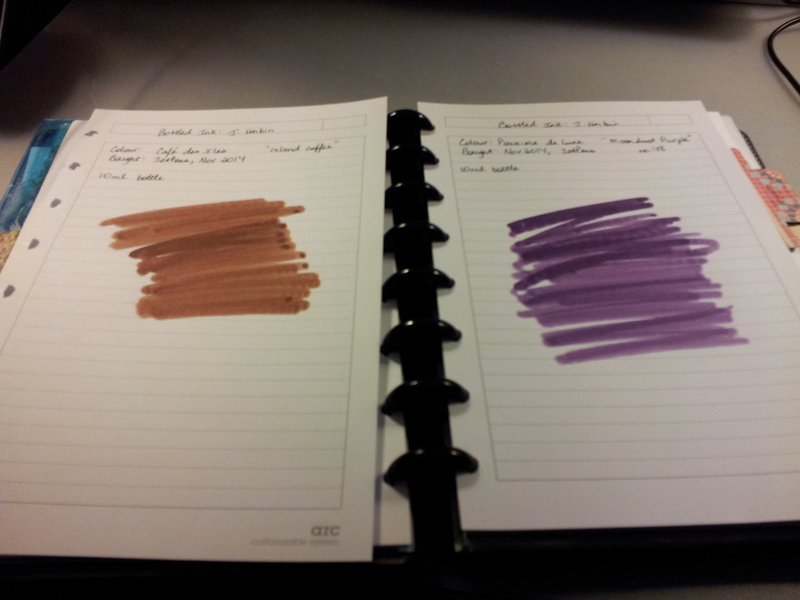 And I really like the match, as seen in the above writing sample, on Rhodia paper. 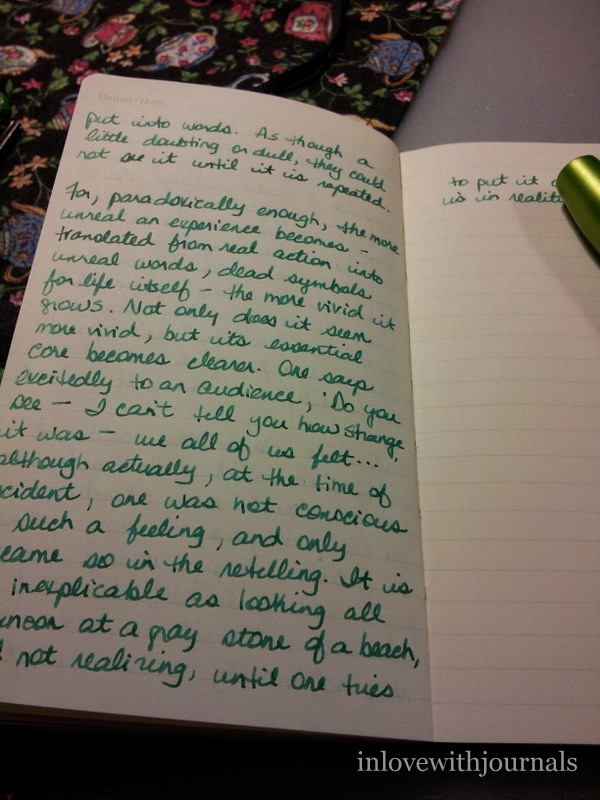 The pen started up almost right away, and the writing is very smooth and even. I think I enjoy writing with this one more than my Safari, but only just. Both are excellent pens. Here’s a close-up of the beautiful body. I really love this colour. 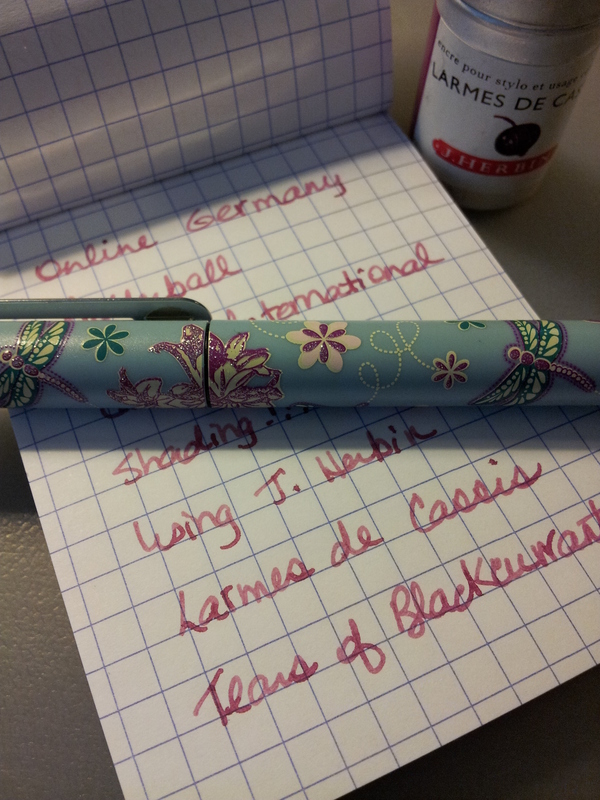 I seem to recall Brian Goulet saying this is the first time Lamy has released a purple pen but I’m not 100% sure on that. 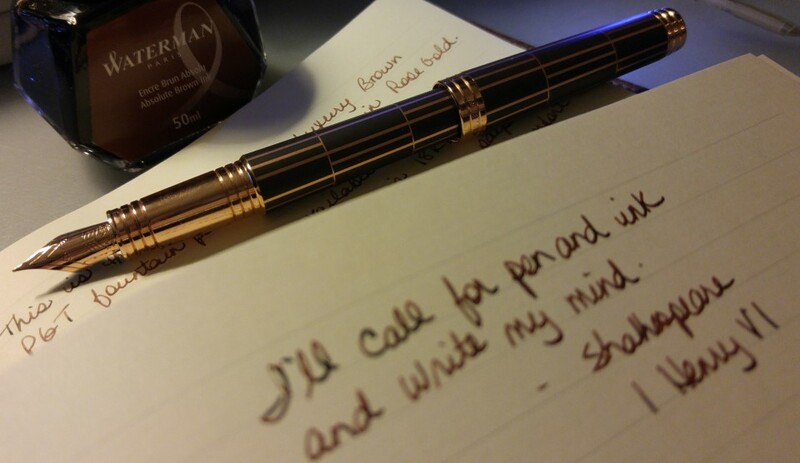 Either way this is an amazing colour and a joy to write with. 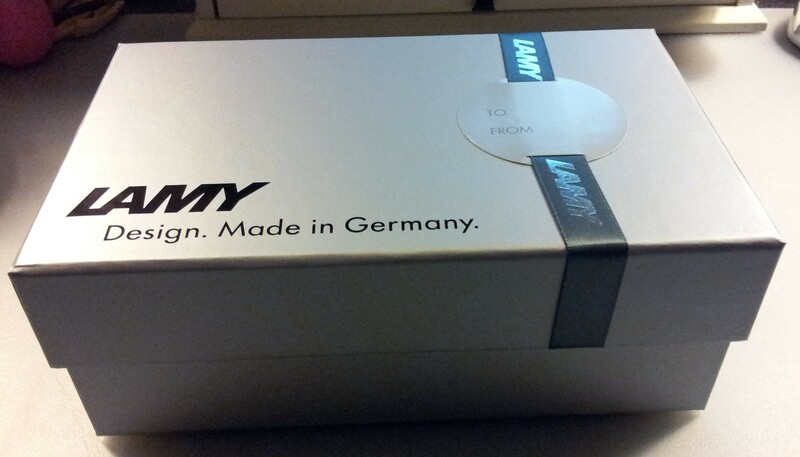 Lamy for Christmas – thank you Dad! I have to apologize for the lack of blog posts this week (Thursday and Saturday). I’ve been quite ill with a ferocious summer cold; I lost my voice on Tuesday and I really haven’t recovered it yet. Lots of coughing with very little sleeping makes for one grumpy girl. But I wanted to write something tonight and I was reading JJ’s comment to my Stamps, Boxes and Filigree Blue post of June 1 and I thought why not do a quick ink test on my Paperblanks journal. So here it is. 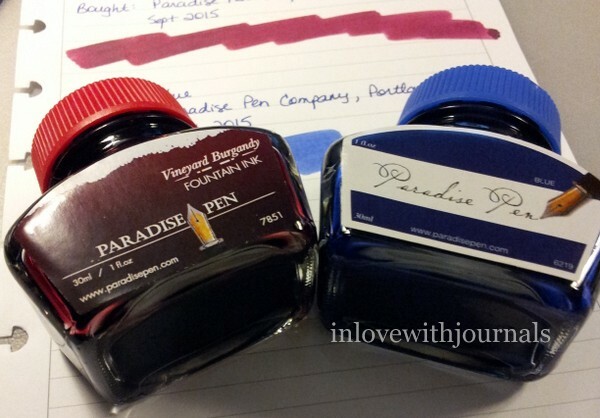 I started out with fountain pen ink and then tried a few others. 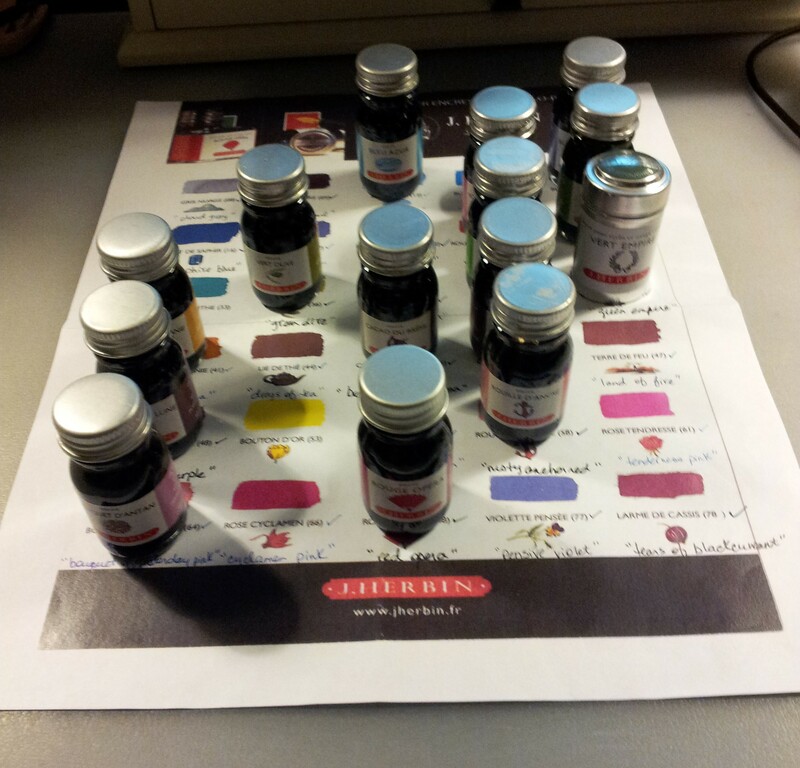 The Hero 6021 is running out of ink and I didn’t take the time to refill before starting to write; sorry about that. But you can still make it out. 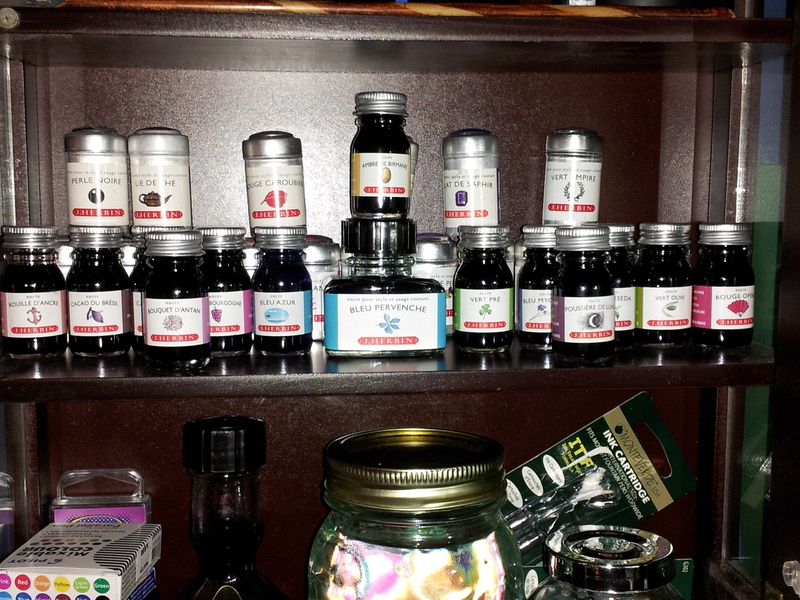 I was really impressed with all the fountain pen ink I tried. 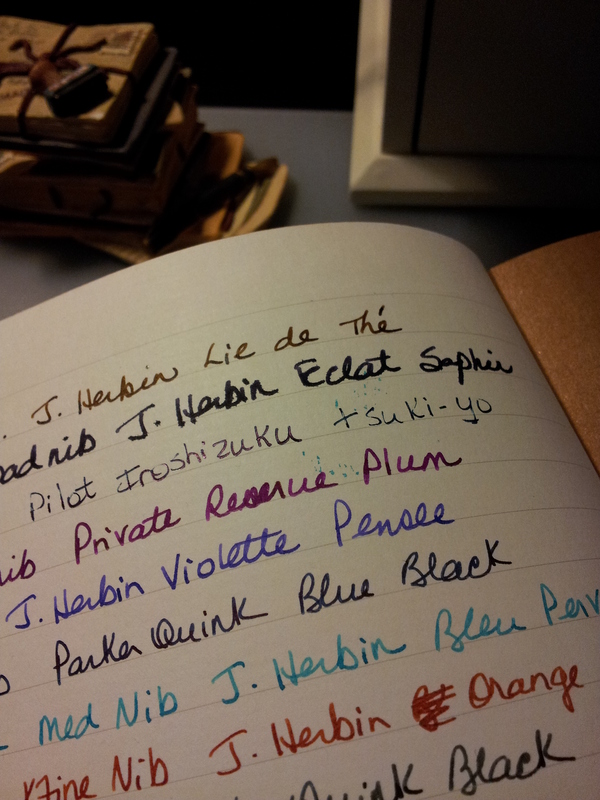 The only one that showed the slightest feathering was the J. Herbin Eclat de Saphir in the Jinhao X450 with a broad nib. 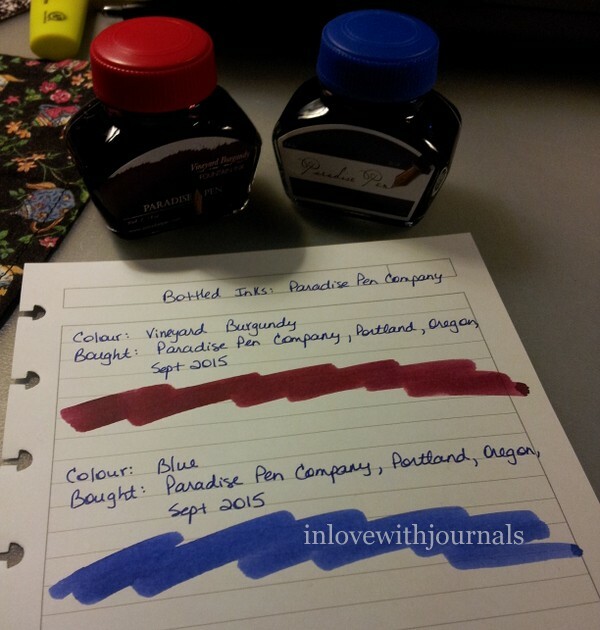 Above you can see all the other fountain pen inks I tried showed no feathering whatsoever. 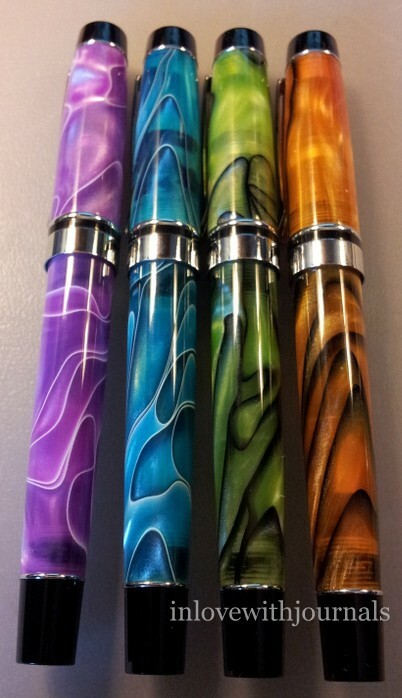 I think they all look amazing, with the exception of the Eclat de Saphir in the Jinhao Broad, and even then the feathering is not overwhelming. 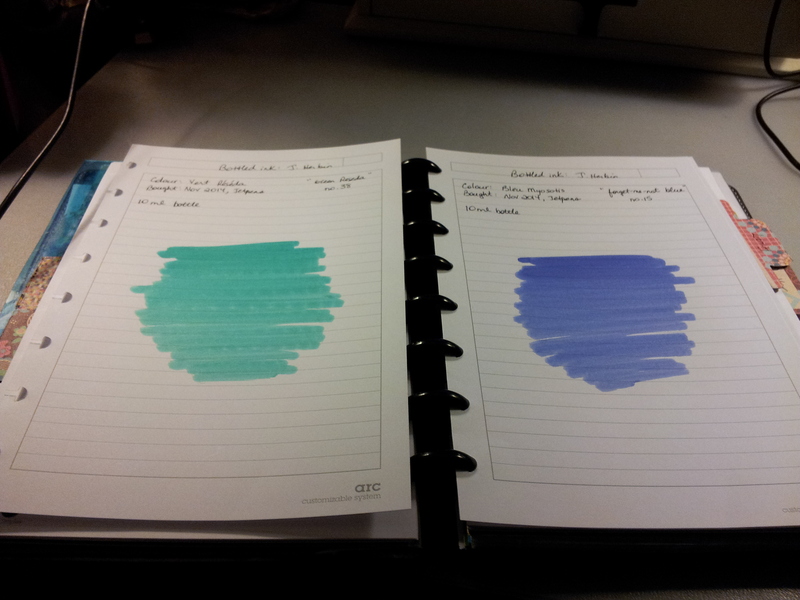 You can disregard the small blue dots; they were the result of some scribbles on the facing page which apparently I did not allow to dry before closing the journal. Nope! 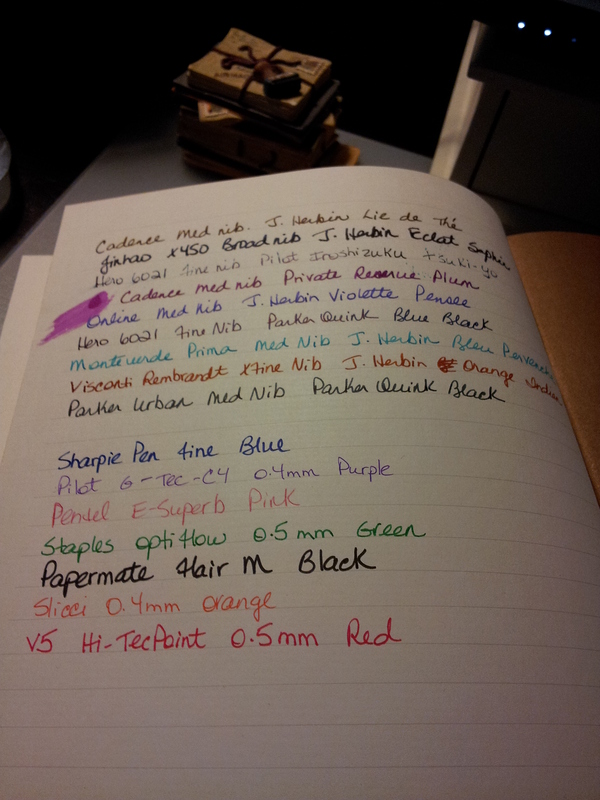 This is the back of the ink test page. You can barely see a whisper of the ink that is on the other side. 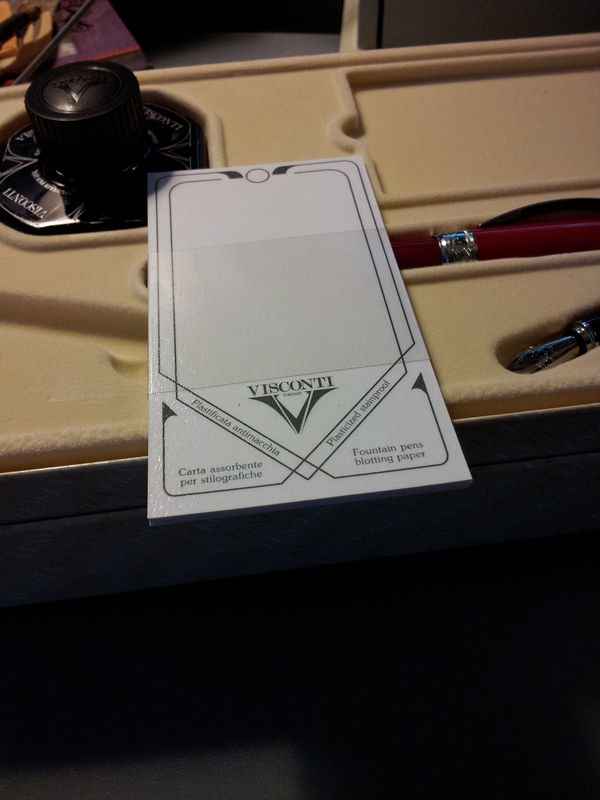 And here is a close-up of the page which corresponds to the ink drop on the back. Sorry for the blurriness but as you can see there is no sign of the ink. Amazing. 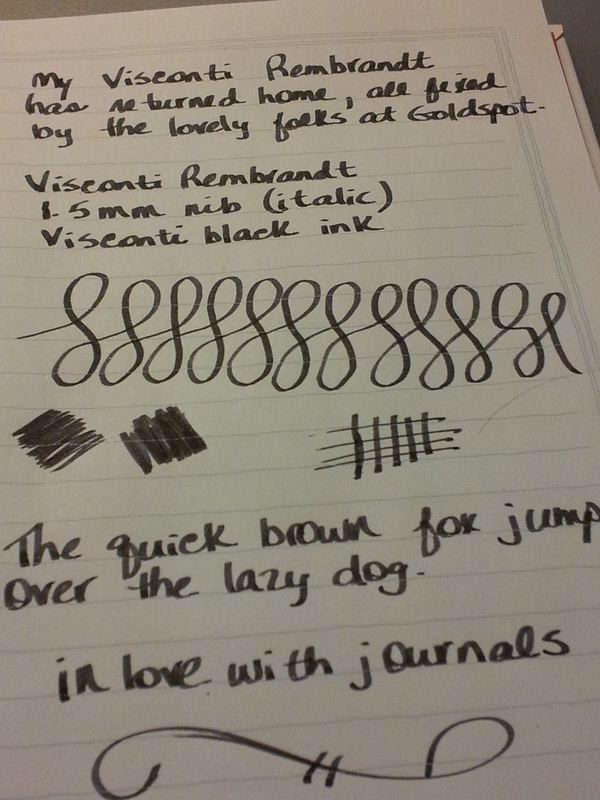 So to sum up the paper in the Paperblanks journals is very friendly to fountain pen ink. I searched for info on their paper on their blog, Endpaper: The Paperblanks Blog and found this post titled Our Paper Quality. It seems in 2008 they changed their paper to a higher quality paper to improve how fountain pen ink took to it. And as you can see from my first photo above, with one exception every ink I tried took to the paper wonderfully. Rest assured your favourite pen will take to this paper too. Try them out and let me know what you think! So my total items purchased this year went from a respectable 7 to a whopping 19 in my last JWW post. I thought I would tackle the pens first. Maybe I should have counted this as two items instead of five, but whatever. 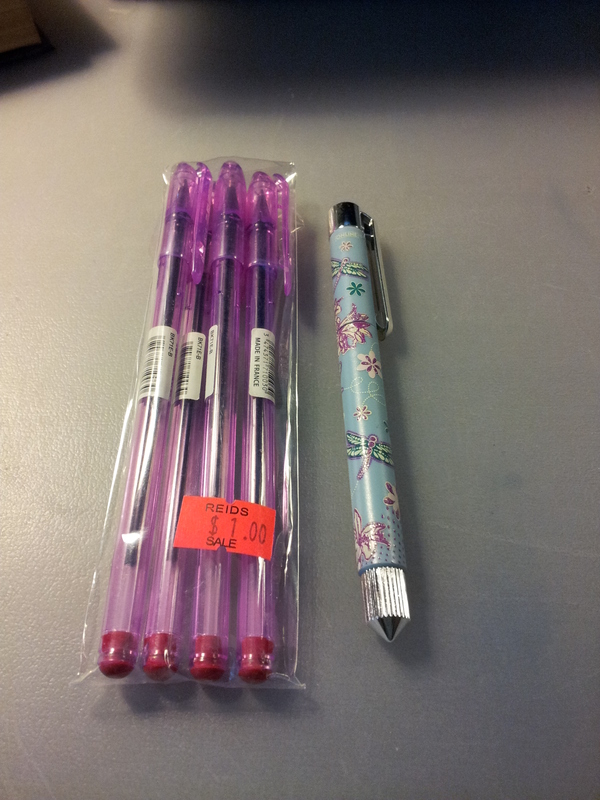 I couldn’t resist four pens for a buck! 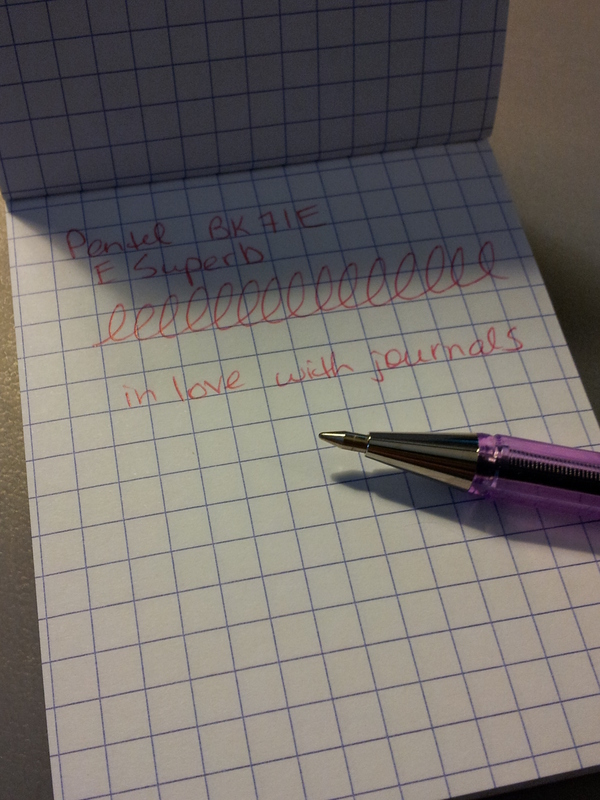 They are Pentel BK71E E Superb; I’ve never heard of them before but they write very nicely. Just regular ballpoints but incredibly smooth on Rhodia paper. 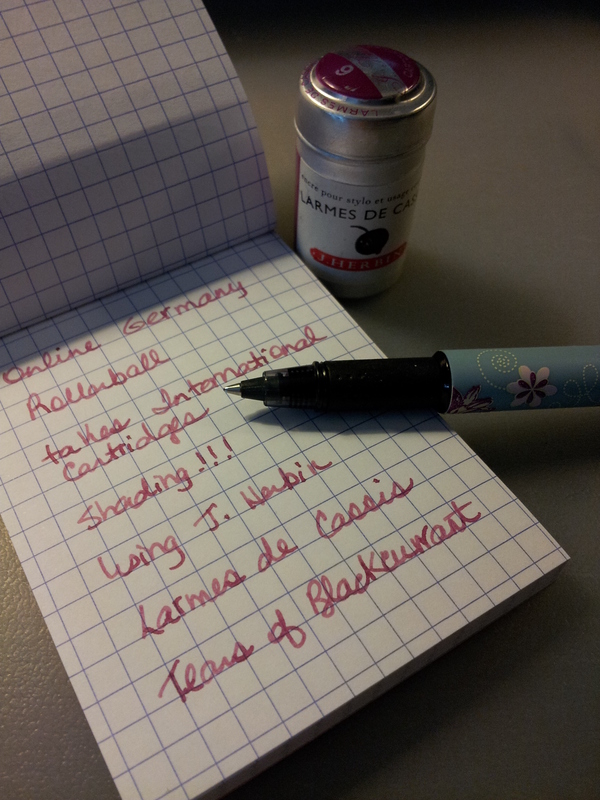 The other pen is another Online pen but this one is a rollerball. 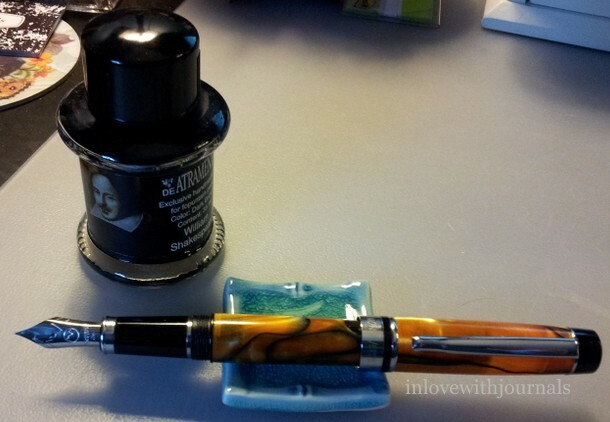 In November 2013 I mentioned my J. Herbin rollerball and it has since cracked it’s casing and is a little tricky to use these days. So I was in the market for another one and my friend and I spied some beautiful pink and purple and blue ones and this is the one I picked. 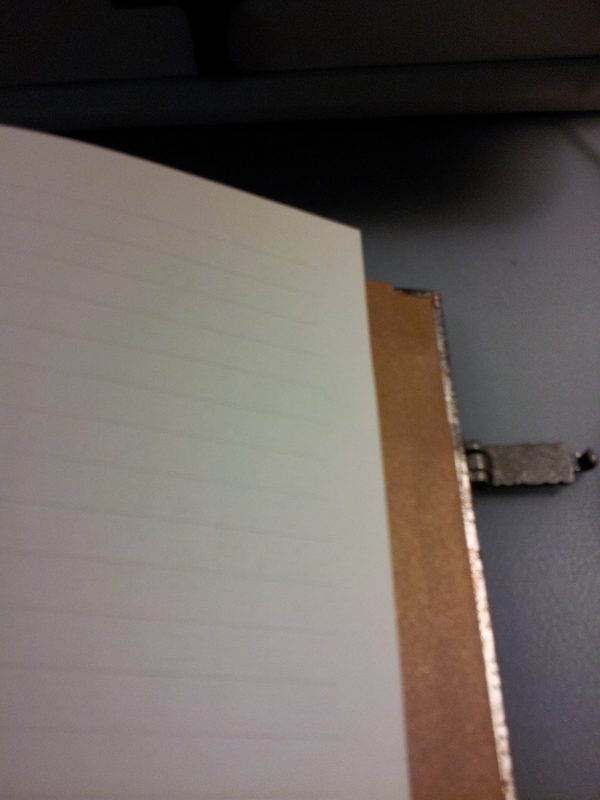 It also writes super smoothly but is a bit of a gusher with the ink. 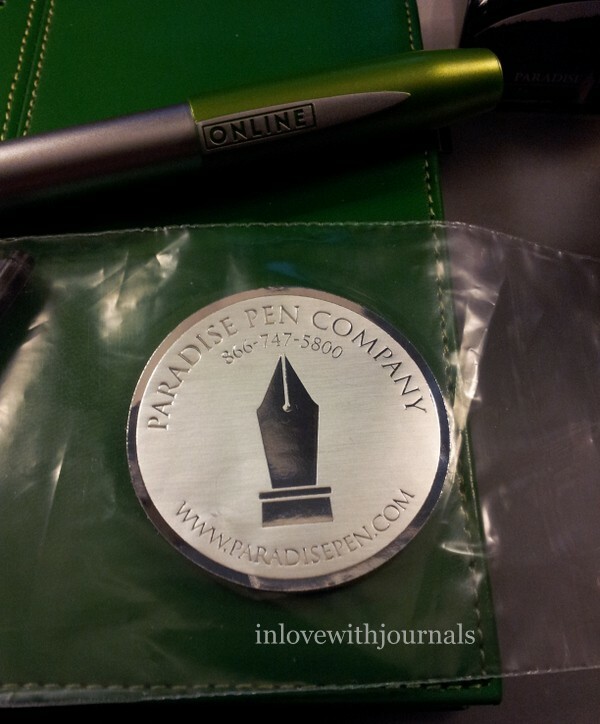 Here is a writing sample with the Pentel. Pink ink for a pink pen! 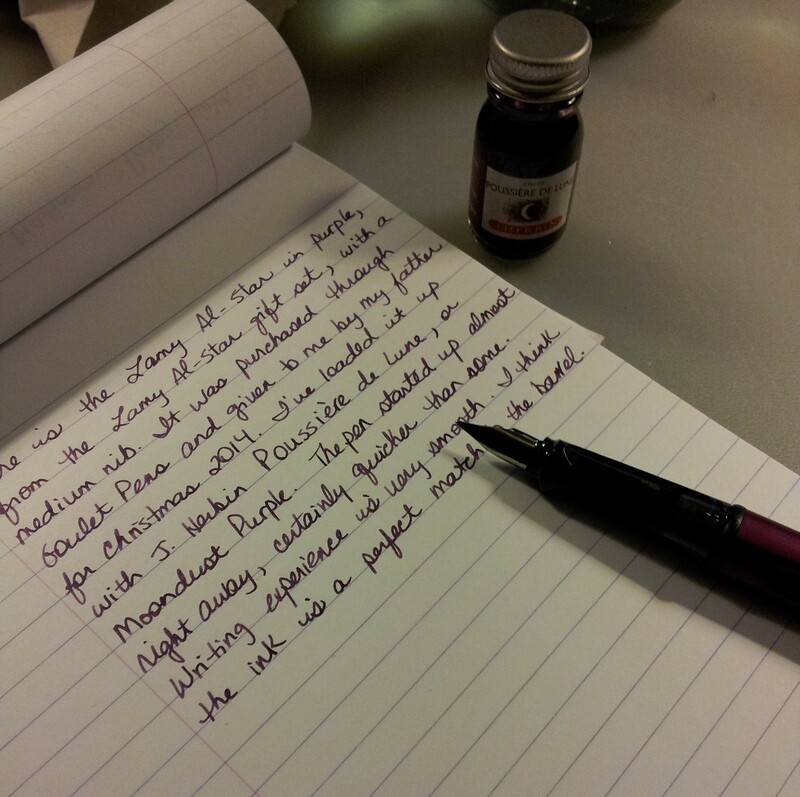 And here is a writing sample with the rollerball, into which I’ve put the J. Herbin ink, Larmes de Cassis, “Tears of Blackcurrant”. It’s a beautiful colour ink and you can really see the shading in this example. Here’s a closeup of the rollerball. Very pretty isn’t it? I’m really loving it. 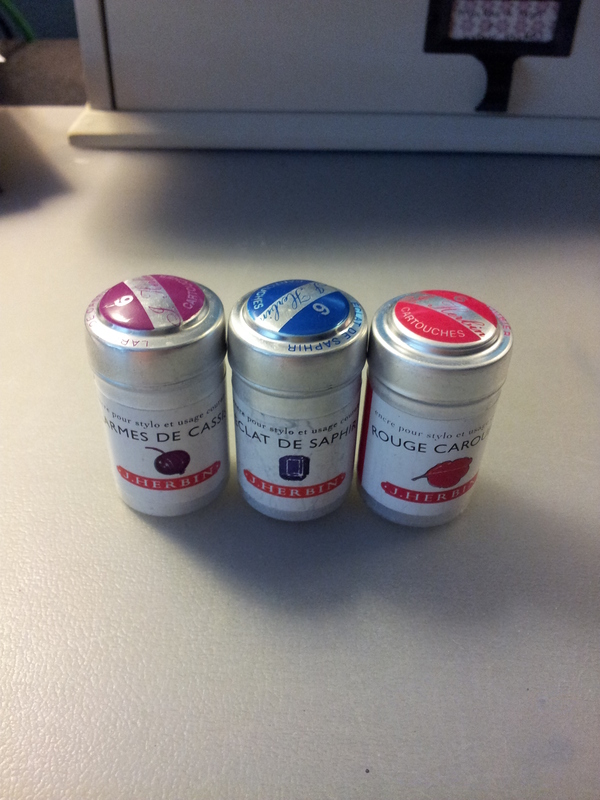 The Larme de Cassis cartridges were also part of the Reid’s shopping spree, along with two other J. Herbin inks: Eclat de Saphir and Rouge Caroubier. 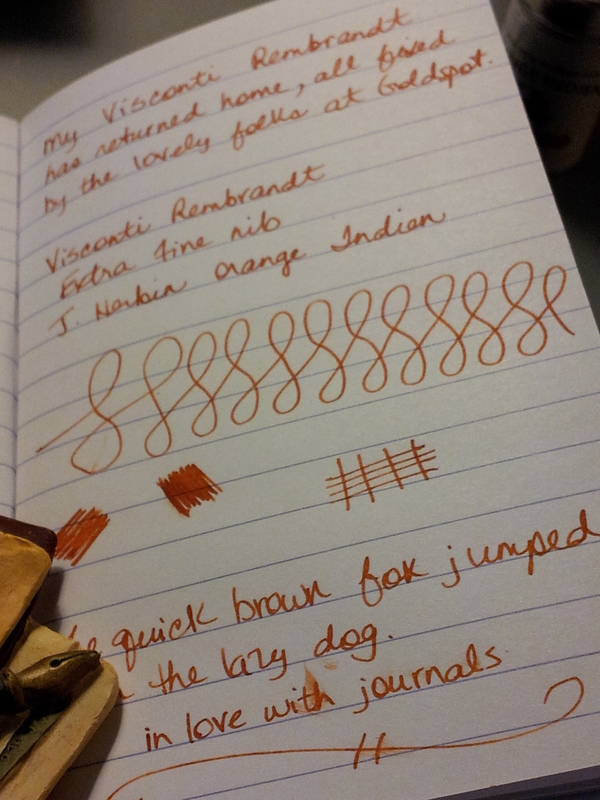 I do not have the Rouge Caroubier in any pen at the moment; perhaps when the Orange Indien runs out I will ink up my Visconti with this one. 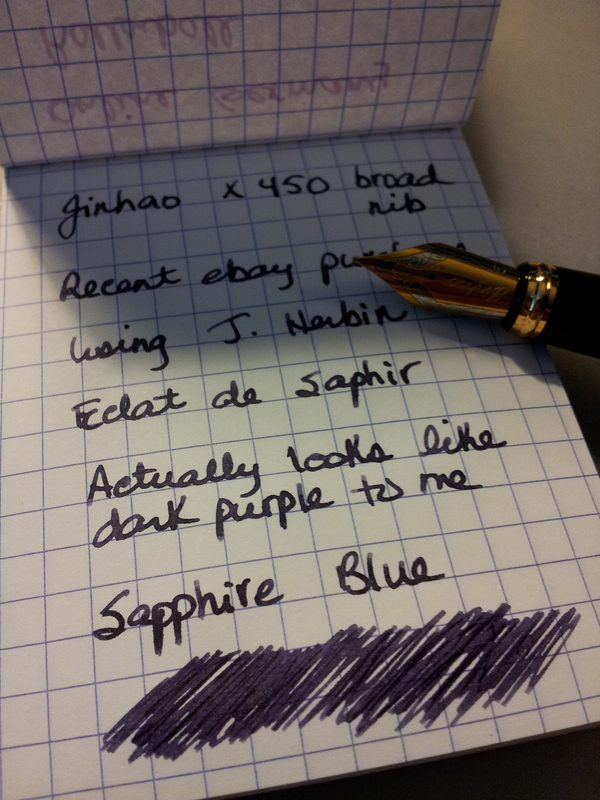 The Larmes Cassis as we just discussed is in the Online rollerball and I put one of the Eclat de Saphir cartridges in my Jinhao X450, which I recently picked up on ebay. I will discuss her in more detail in another post, but her barrel is what I think of as Sapphire blue so I thought the Eclat de Saphir would be the perfect colour for her. But it’s not, at least not to my eye. 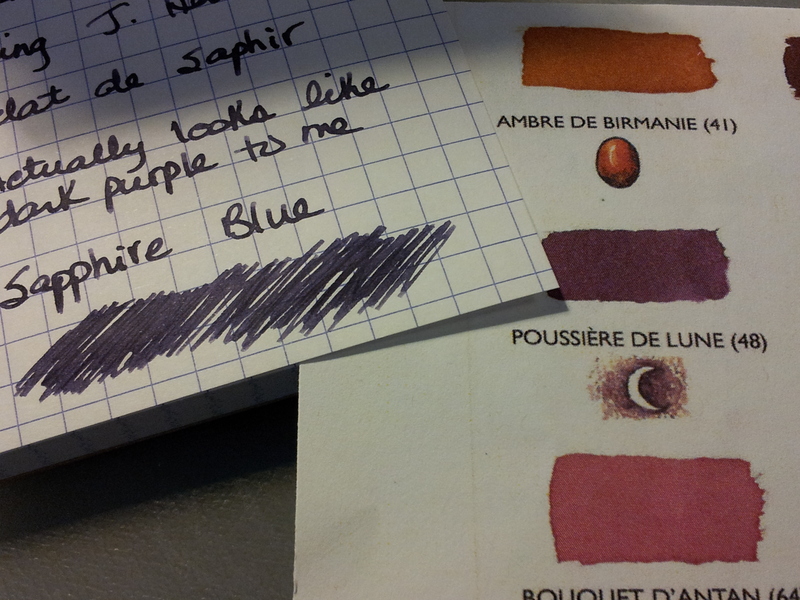 This is the colour for Eclat de Saphir. But it looks more like a dark purple to me; it’s almost black. I know you can’t see the barrel colour in this shot but I compared this ink with the ink sample sheet I printed off the internet. 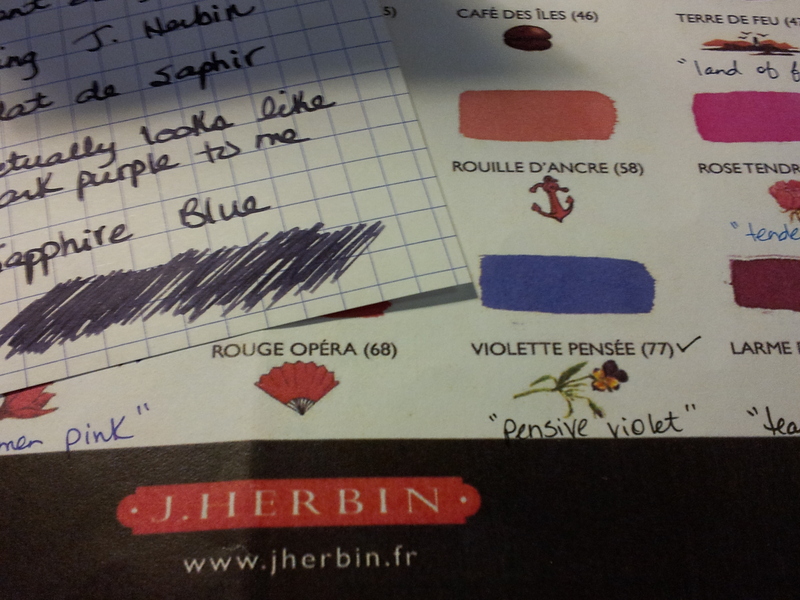 I’m not sure which ink this most closely resembles in the J. Herbin line. 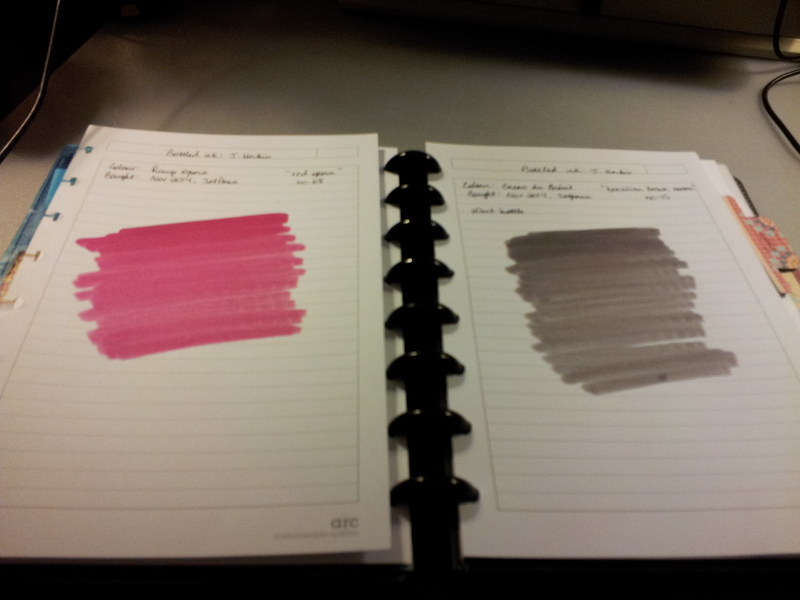 When compared to the sample sheet it doesn’t look like Eclat de Saphir; it’s closer to Bleu Nuit. Not quite Poussiere de Lune either. 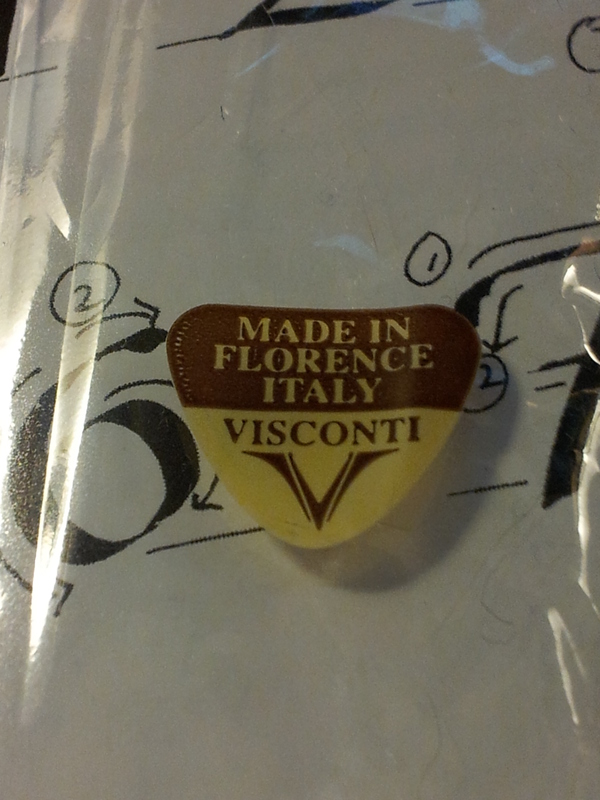 I thought maybe the Violette Pensee. But no. 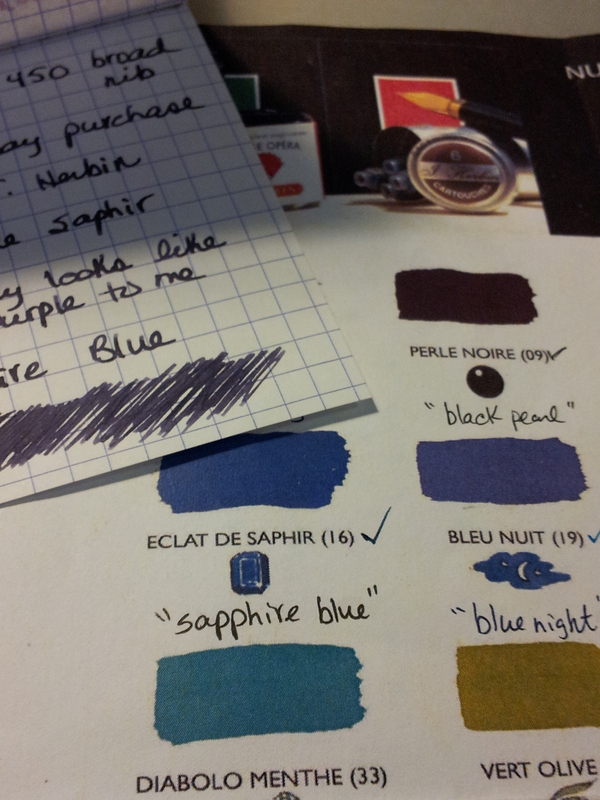 And then I noticed that my Bleu Nuit tin is right next to my Eclat de Saphir tin. So maybe in my excitement I mixed up the cartridges. 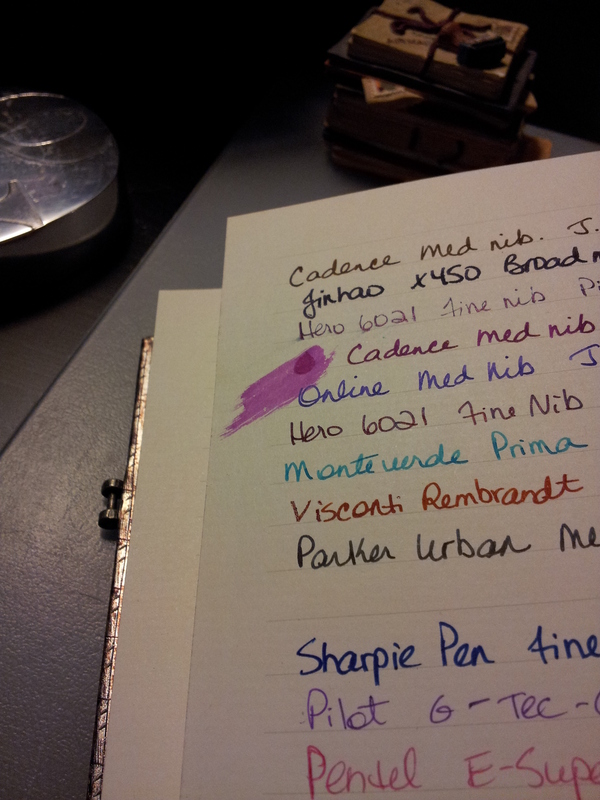 I guess I will have to wait until this ink is used up and try again. 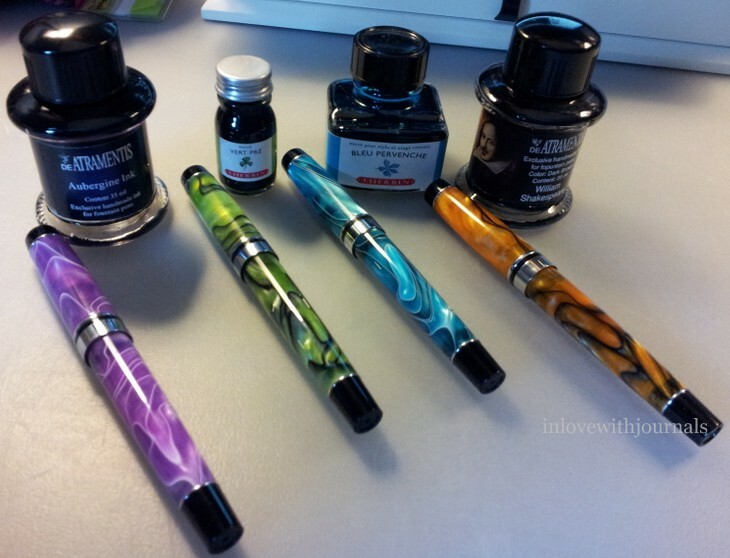 So that’s it for the pens and ink from my shopping spree at Reid’s. 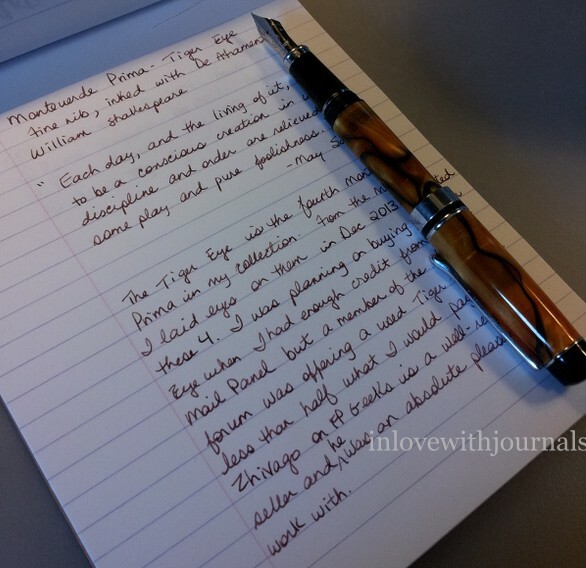 I will do another post on the notebooks I bought, as well as a post on the Jinhao, which will be added to the list of purchases on the next JWW. I am happy to report a package from Goldspot arrived at the office on Friday. 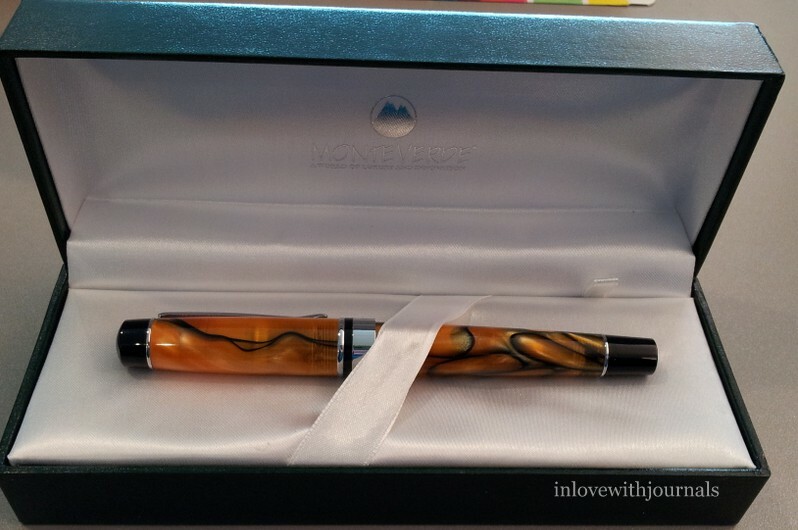 Inside was my Visconti nib with a newly fitted section, which had been missing in the initial shipment, which I first mentioned in this post. 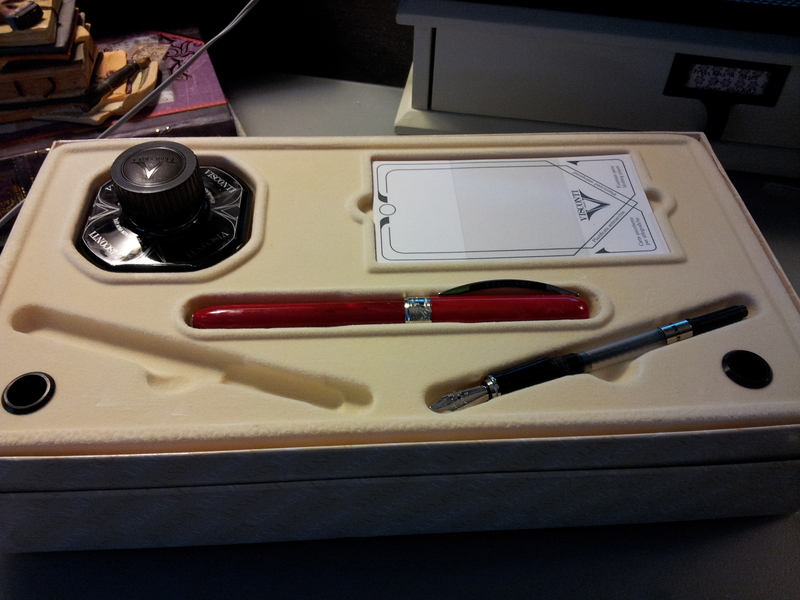 So I can finally give a complete review of the Visconti Rembrandt Calligraphy Set in Red. 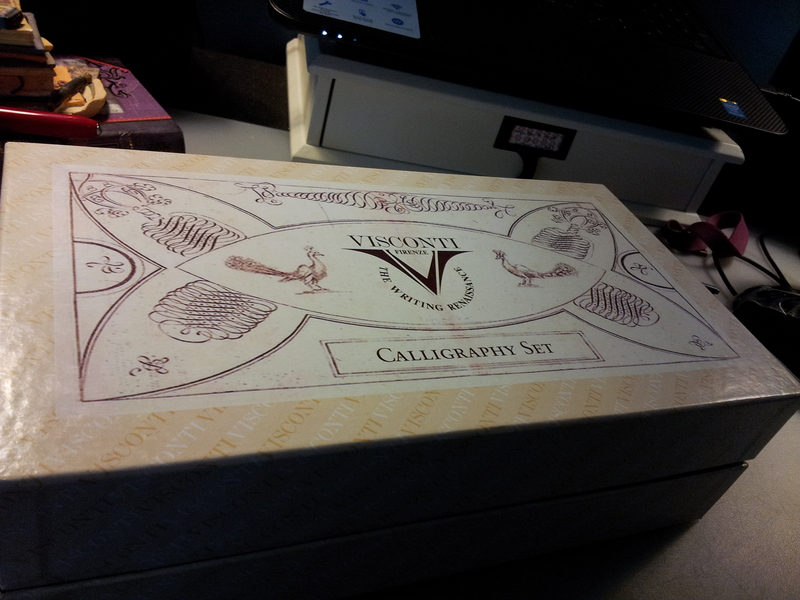 The box in which the calligraphy set originally arrived. 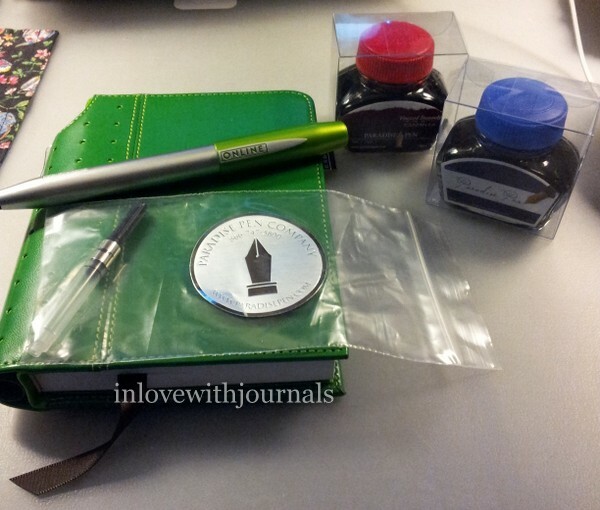 The set came with an inkwell, blotting paper, the pen body, two converters and two nibs. 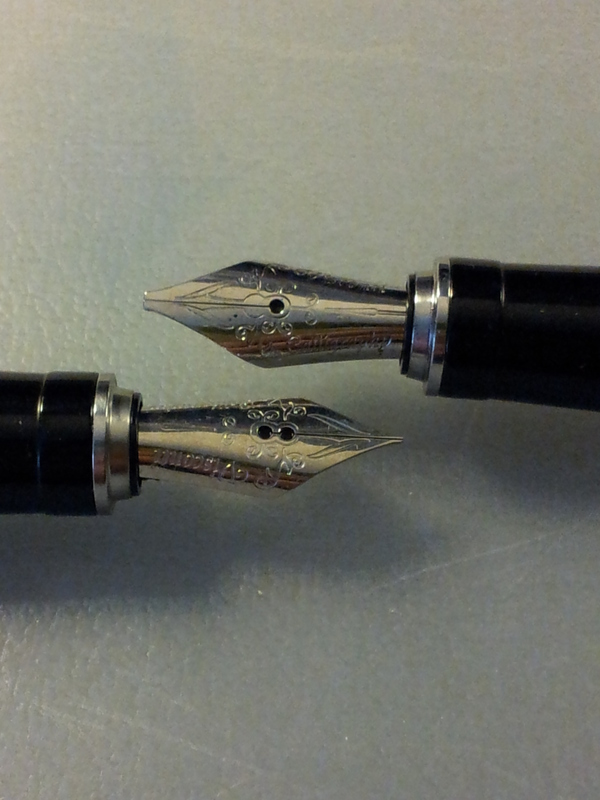 In this picture the extra-fine nib is in the pen, while the italic nib with it’s new section is lying in its bed as it should be, nice and snug, instead of rolling around. 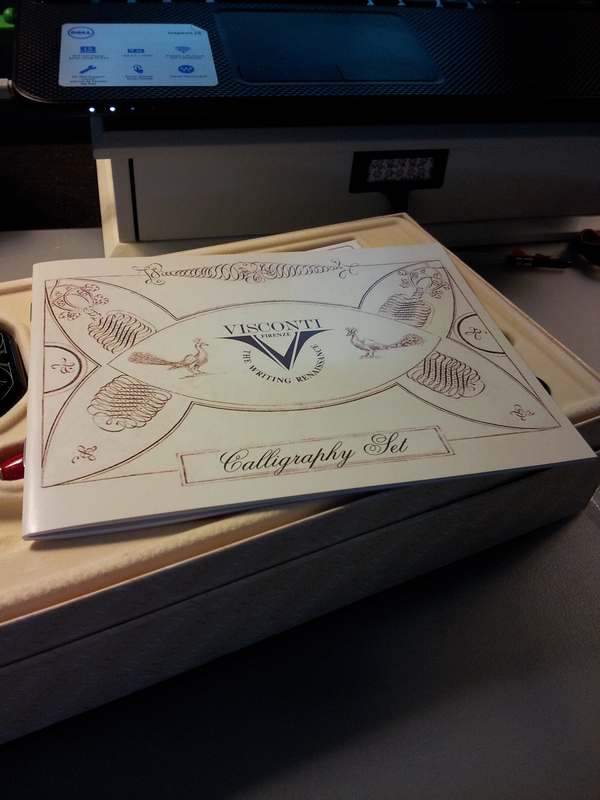 The booklet that came with the set not only gives instructions on filling the pen but also introduces the various types of calligraphy: Italic, Gothic, Uncial, Foundational, Rotunda and English Script. 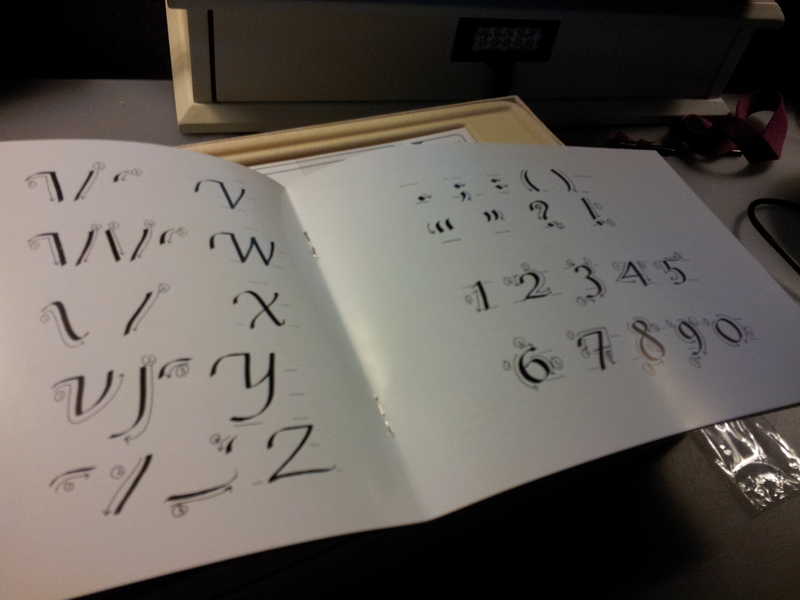 There are detailed pictures of how to produce each letter. I think my favourite is Foundational, which is the third up from the bottom. Makes it look easy! I wish. A close-up of the blotting paper. Apparently it has a plastic coating to protect fingers. The inkwell. This one is plastic; they also come in glass bottles. Beautiful shape to the bottle; very distinctive. 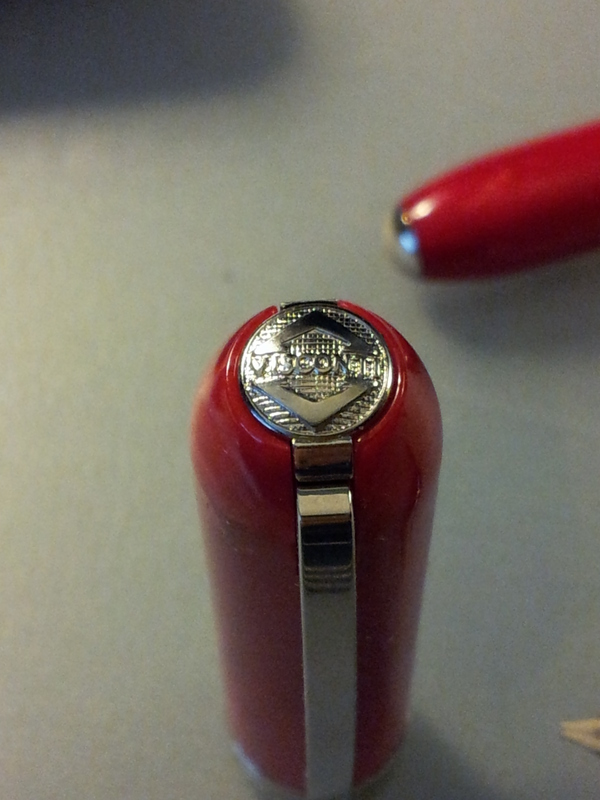 And inadvertently I got a great closeup of the pen. Love the variation in the barrel colour, the decorated band and the iconic clip. The pen body came wrapped in this plastic sleeve. No doubt about where it was made. 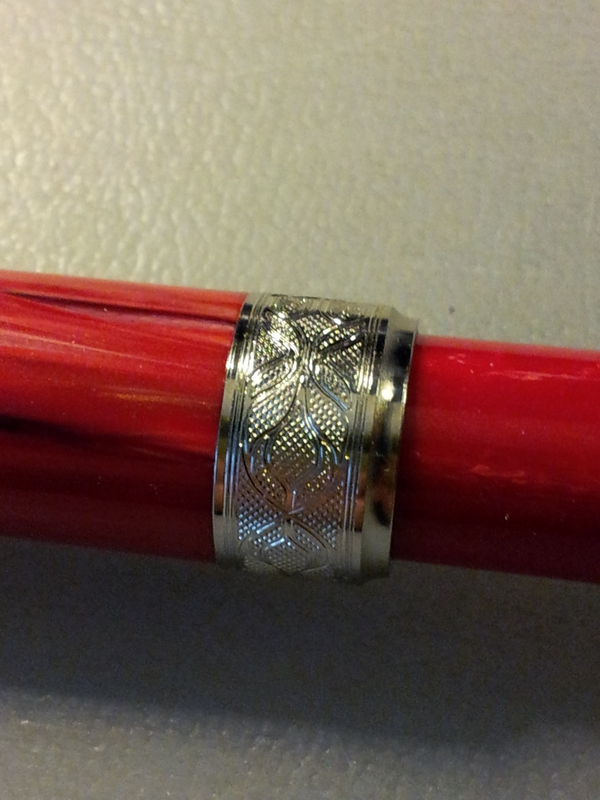 Close-up of the detail on the band. So pretty. The other side says Rembrandt. Sorry couldn’t resist the cap again – love it! 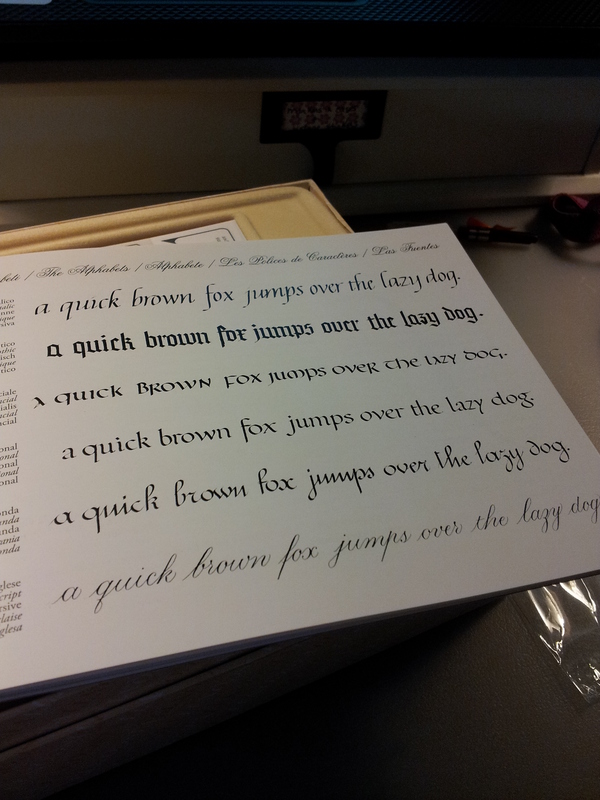 The nibs; italic on top, extra-fine on the bottom. 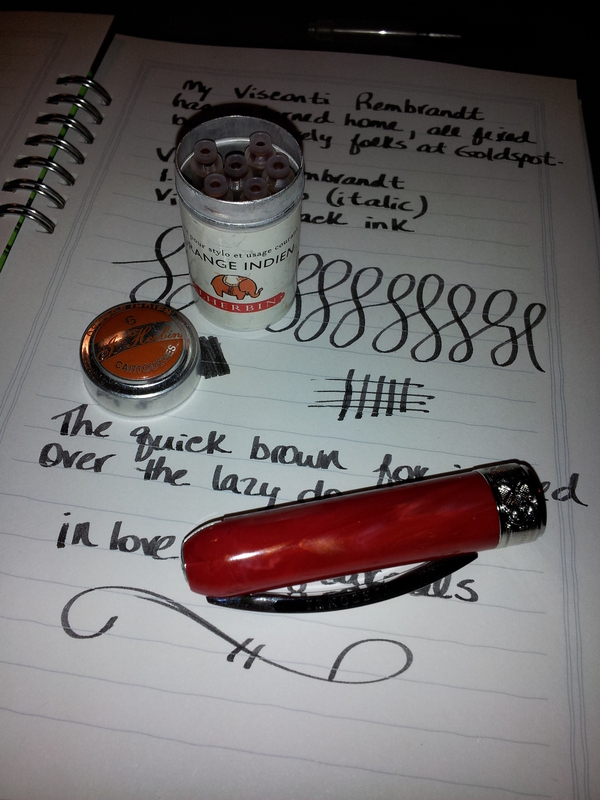 I’ve had this J. Herbin Orange Indien since my Christmas visit to Reid’s Stationers. 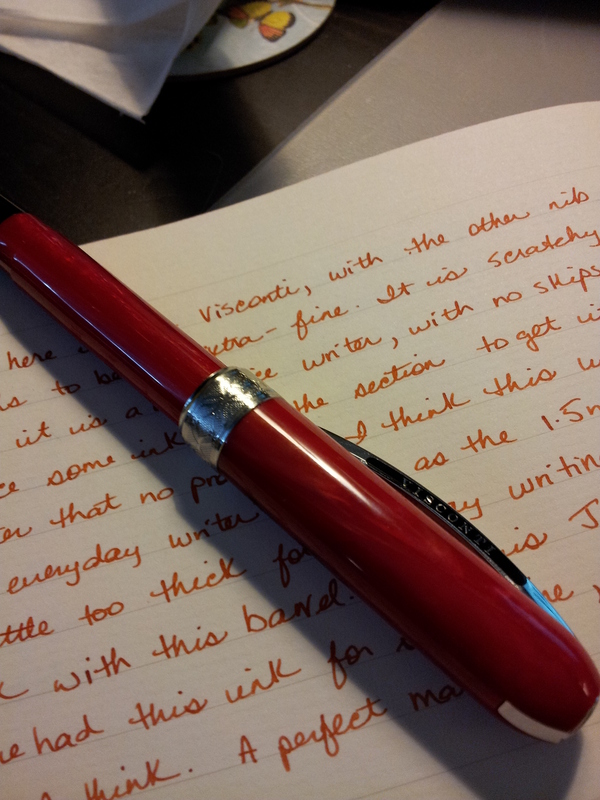 When I saw the orange undertones of the Rembrandt barrel I immediately thought of my only orange ink. I think it’s a good match. Such a difference to the first nib. 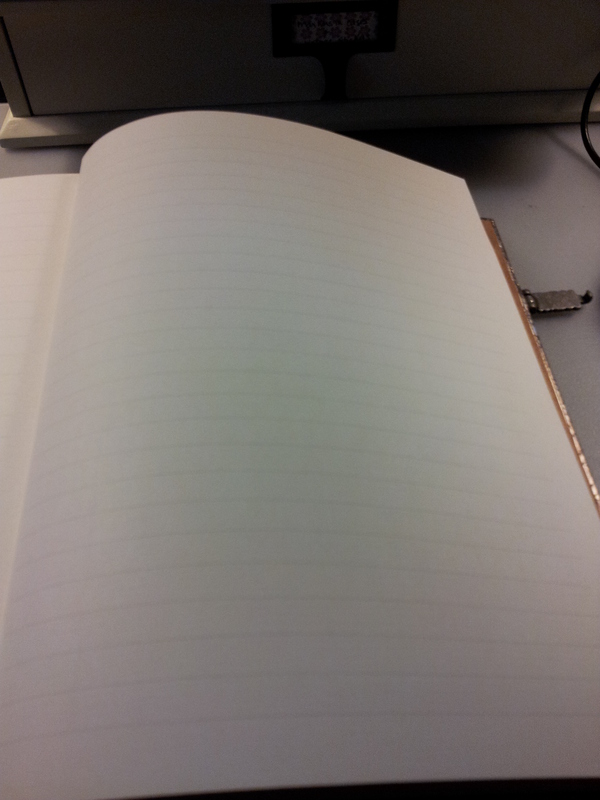 It is a very nice writer, with no skipping. It was a bit scratchy on the paper (Clairefontaine) but that’s to be expected with an extra-fine nib. I had to force some ink into the section to get it going but after that no problems. I think this will be more of an everyday writer for me. I know this is the “budget” version of the Rembrandt, as the one I tried out at Reid’s Stationers had a metal section (not plastic) and a magnetized finial that could be customized. But that really doesn’t matter to me; this version brought it into the realm of possibility and I am thrilled with it. I am very grateful to my husband for buying it for me and also to the excellent folks at Goldspot for making it perfect. You can check it out yourself here, although it is no longer on sale. 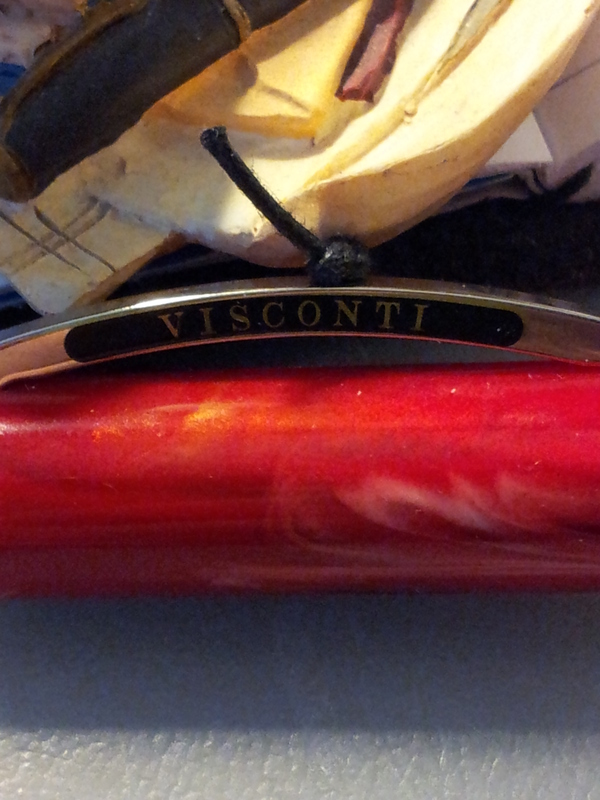 And if you really want to dream, take a look a the rest of the Visconti line here.